A United Launch Alliance Atlas V rocket carrying the new SBIRS GEO Fight 4 missile- warning satellite stands atop Space Launch Complex 41 at Cape Canaveral Air Force Station in Florida ahead of a scheduled Jan. 18, 2018, launch. Update for Jan. 19: ULA's launch of an Atlas V rocket carrying the SBIRS GEO Flight 4 missile-warning satellite for the U.S. Air Force is now scheduled for Friday, Jan. 19, at 7:48 p.m. EST (0048 GMT on Jan. 20). Watch it live here. The U.S. Air Force's newest early-warning satellite for missile defense will launch into space from Florida tonight (Jan. 18), and you can watch the action live online. 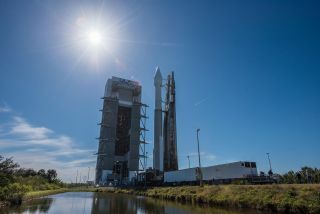 A United Launch Alliance Atlas V rocket will launch the new military satellite, called the Space Based Infrared System (SBIRS) GEO Flight 4, from Space Launch Complex 41 at the Cape Canaveral Air Force Station. Liftoff is scheduled for 7:52 p.m. EST (0052 GMT on Jan. 19). ULA will provide a live launch webcast beginning at 7:32 p.m. EST (0032 GMT). You can watch it live on Space.com here, or directly from ULA's YouTube channel. Built by Lockheed Martin, SBIRS GEO Flight 4 is the fourth member of a growing constellation of early-warning satellites designed to detect the launch of ballistic missiles from space. The satellites fly in geostationary orbits, and carry powerful scanning and infrared surveillance gear to track missile launches from orbit. The first two satellites, SBIRS GEO Flights 1 and 2, have been operational since 2013. SBIRS GEO Flight 3 launched in January 2017. Two other satellites, SBIRS GEO Flights 5 and 6, are expected to follow. The Space Based Infrared System GEO Flight 4 missile-warning satellite is seen during assembly and test at Lockheed Martin’s satellite manufacturing facility in Sunnyvale, California. "SBIRS provides our military with timely, reliable and accurate missile warning and infrared surveillance information," Tom McCormick, vice president of Lockheed Martin's Overhead Persistent Infrared systems mission area, said in a Nov. 28 statement when SBIRS GEO Flight 4 was shipped to its Florida launch site. "We look forward to adding GEO Flight 4's capabilities to the first line of defense in our nation's missile defense strategy."